Hi, my name is Kristina and I am a genius….But not just any genius! I am a vodka-popsicle creating genius. Yes, that’s right I made popsicles. That are paleo. BUT WITH VODKA. Hey girl heyyyy. These popsicles took me awhile to figure out. As many of you know, alcohol isn’t one to easily freeze. I was so frustrated from trying to create these in the beginning; I had several popsicles that ended up crumbling, falling apart, or never completely freezing in the first place. I recruited help from several different friends, however, I never asked the one person, Dani, who actually works with alcohol for her career. Whaaaaat? Why? I don't know. I'm not too bright sometimes. So, alcohol isn’t typically included in a paleo diet. If you are new to paleo and still eliminating foods, following an AIP diet, or sensitive to starches or sugars, this recipe isn’t for you. I’m so sorry. However, in my paleo journey, I have discovered that there is a huge difference in not only types of alcohol, but in different brands of liquor too. I’ve delved into tequila with my Paleo Blood Orange Margaritas here, but today we’re talking about vodka. I have found that I can personally tolerate certain types of vodka, and they usually are the ones that have the least ingredients in them. (I know, shocker.) In particular, Tito’s Vodka is actually made from corn, not potatoes, which is what gives it a distinctly different taste. Tito’s is also distilled six times, which is what I truly believe makes me able to drink it without getting sick, and doesn’t give me a huge headache the morning after. Tito’s Vodka doesn’t have any gluten, and unlike other distilleries, doesn’t add gluten back into its final product. But better yet, Tito’s is available at most stores, and is very reasonably priced for the quality. I even found it at Sam’s Club not too long ago, which means it was at an even better price. Looking back, I definitely want to slap my college-self for not realizing that quality of alcohol makes all the difference, because my favorite thing to do back then was to get Hawkeye Vodka (Thanks, IOWA! ), which was $3-$5 a liter, and burned for literally 15 minutes after each shot. I can’t even imagine all the damage that was done to my body from those years. Ugh. I am posting the recipe for these vodka pops just before the 4th of July because, hello par-tay, but because they only need a few ingredients, and can easily be thrown together the night before your 4th of July celebration. Oh, and these totally take on a red, white, and blue color scheme, which means that your 4th of July food will be color coordinated to the holiday. Super. Cool. Or nerdy. Maybe. To make these popsicles, you will need a popsicle mold- there’s just no way around it. But guess what? I found some for $1 at Dollar Tree, $2 at WalMart, and $3 at Target. You. Are. Welcome. Since vodka can have an overpowering taste, it is best to keep the vodka content in these popsicles to 2-3 shots per entire volume. When experimenting with these, I added as much as 5 shots. 5 was much too overpowering, and the popsicles had difficulty freezing. If you want more bang for your buck, I would add 4, but no more, but still understand that they will have a strong alcohol flavor. 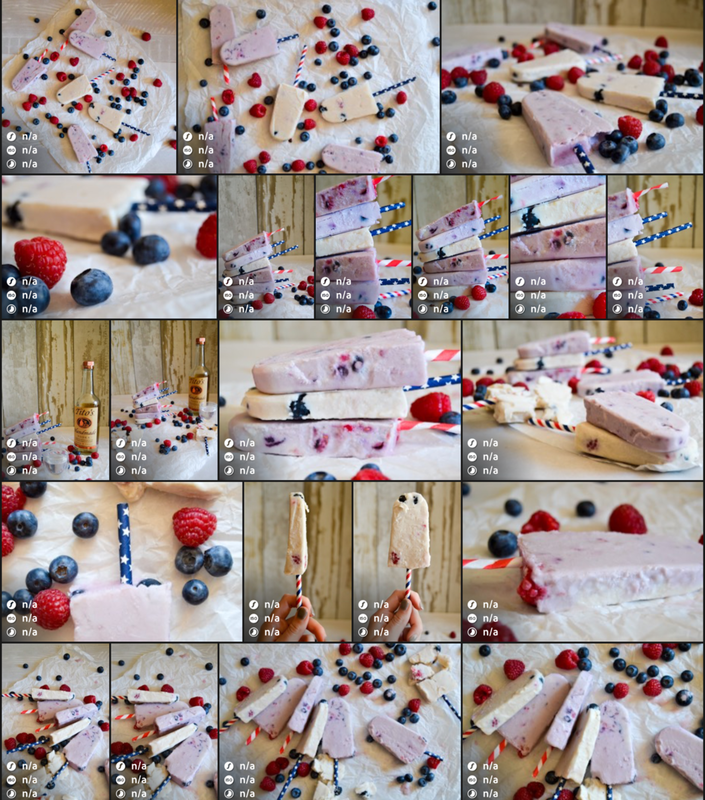 The purpleish colored popsicles were given their color by letting the entire berry mixture sit for about 4 hours before adding it to the popsicle mold. Instead of using popsicle sticks for these popsicles, I used printed paper straws. However, I quickly realized that they look great for photos, but don’t hold up well when eating. In a large saucepan, add coconut milk, vanilla, and honey. Place saucepan on low-medium heat. Heat coconut milk mixture until honey has melted. Do not bring mixture to a simmer. Remove pan from heat immediately once honey has completely melted and set aside to let cool. While mixture is cooling, place 1/4 cup of raspberries and 1/4 cup blueberries in a large bowl. Muddle berries with a large spoon or bottom of a drinking glass. Once coconut milk mixture is lukewarm, add muddled berries to coconut milk mixture. Add vodka to mixture and stir to combine. Pour mixture into popsicle molds. Add remaining un-muddled, whole berries into molds by dropping them into each mild slowly. Place in freezer and let freeze overnight, for at least 7 hours.